The defense team has accused former Manafort associate Rick Gates of embezzling money and said Gates is cooperating and lying to investigators to cover his tracks. 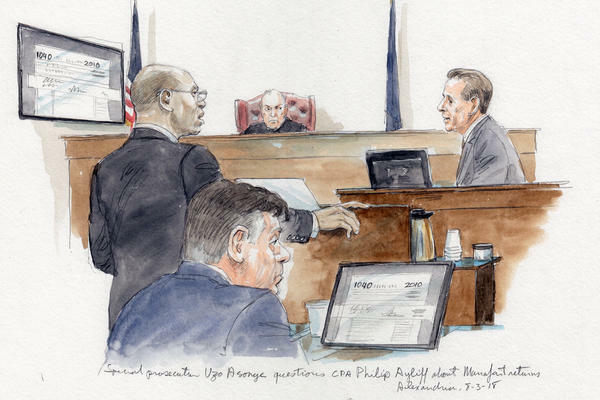 Special prosecutor Uzo Asonye is depicted questioning certified public accountant Philip Ayliff about onetime Trump campaign chairman Paul Manafort's tax returns. Bank and tax fraud trials normally aren't very compelling theater. When it's the former campaign chairman for the current president of the United States, however, and it's the first trial brought by a special counsel tasked with investigating Russian interference in American democracy, things are a bit more interesting. TV cameras lined up before 5 a.m. in preparation for the first day of Paul Manafort's federal trial last week. At one point Wednesday, after a prosecutor played coy about a key witness testifying, reporters scurried to break the news like "rats," outspoken Judge T.S. Ellis III remarked. And that's not even mentioning the $15,000 ostrich leather jacket. Here are four insights from the week that was and a look ahead to Manafort's second week on trial in Alexandria, Va.
At a certain point in the middle of last week, it seemed like maybe all the jury would hear about was what expensive things Manafort owned. A witness from a landscape company talked about flower-lined tennis courts at Manafort's property in the Hamptons on Long Island, N.Y. A witness from a home electronics company said Manafort spent more than $2 million over a five-year period with his company. And then there were the clothes: a jacket made from python skin, more than $1 million spent on suits over five years and the aforementioned ostrich jacket. Ellis pushed back on prosecutors, reminding them it's not a crime to be rich in America. He worried that talking so much about Manafort's expensive taste could prejudice the jury against him. But more important than what Manafort bought was how he bought it. Each vendor testified that Manafort paid via wire transfer from offshore bank accounts. Maximillian Katzman, of the luxury menswear boutique Alan Couture, told the jury that Manafort was the only customer he worked with who paid like that. "Manafort's practice of paying his vendors directly with his offshore funds was designed to hide the underlying income from his bookkeepers and return preparers, and ultimately the IRS," prosecutors wrote in a motion on Wednesday night, as they argued why talking about Manafort's spending was valid. Prosecutors turned midweek from what Manafort bought and how he bought it to what they see as his efforts to avoid paying taxes when things were good and lying to banks about his income when things went south. Three witnesses who dealt with Manafort's money testified that he did not tell them he had foreign bank accounts. Philip Ayliff, a tax accountant who said he began working for Manafort in 1997, testified that in the process of filing Manafort's tax returns, Manafort had multiple opportunities to disclose foreign bank accounts but did not do so. "We asked the question and the response was no," Ayliff said. Prosecutors say Manafort was flush with cash from his political consulting work for the pro-Russia leader of Ukraine, Viktor Yanukovych, but when Yanukovych was ousted in 2014, that money dried up and Manafort needed loans to keep up his expensive lifestyle. A bookkeeper who worked with Manafort, Heather Washkuhn, testified about Manafort's financial woes. Emails presented in court show that at one point, she informed Manafort that his company's health insurance plan was going to be canceled because the bill had not been paid. Washkuhn's testimony also seemed to point toward Manafort's doctoring documents in an effort to inflate his income and qualify for loans. A document prosecutors say was sent to a bank showed a much higher income for Manafort's company than documents Washkuhn's firm produced. And at the end of the day Friday, an accountant named Cindy Laporta testified, under an immunity deal with prosecutors, that she had concerns when she helped Manafort apply for a bank loan that information he provided her was false. The fact that Manafort has even taken this case as far as a trial — as opposed to cooperating with investigators and negotiating a plea deal — is surprising, says Sam Buell, a former federal prosecutor and a white-collar-law expert at Duke Law School. That is because, given how much evidence is spelled out in black-and-white in a paper trail, it's very hard to find a strategy for defending against the charges. 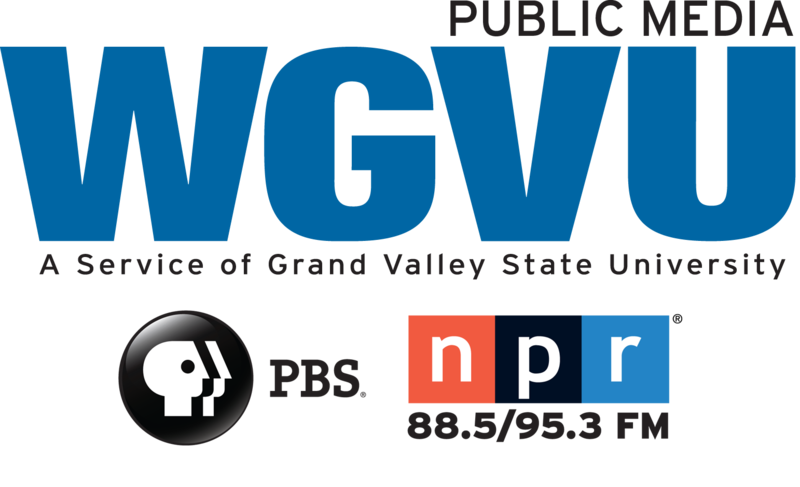 "You've got to try to find a way to throw a monkey wrench in," Buell said. "I don't see a monkey wrench so far." That wrench could come next week in the form of testimony from Manafort's former business partner and right-hand man, Rick Gates. Manafort's defense lawyer Thomas Zehnle made it clear in his opening statement that his team was going to attempt to pin the financial crimes Manafort is accused of on Gates, who is cooperating with investigators after entering a guilty plea in February. Zehnle accused Gates of embezzling money and said Gates was now cooperating with and lying to investigators to cover his tracks. 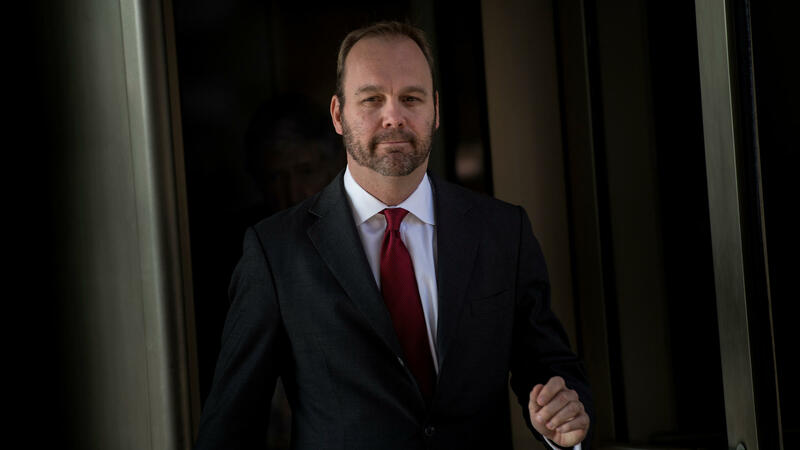 Prosecutors would not put Gates on the witness stand if they weren't supremely confident that he will help their case with his testimony, Buell said. Still, it will offer Manafort's defense team a chance to hammer away at Gates' credibility and plant doubt in the minds of jurors. "Cross-examination is a crucible," Buell said. "But [Gates] will be well-armored for it, with preparation." With offhand remarks, aggressive pushback and a need for speed, Ellis has become a character in this trial himself. The 78-year-old Reagan appointee was more than pleased when prosecutors signaled they could be ready to rest their case by Friday. After all, the federal court in suburban D.C. where Manafort is being tried is known as the "rocket docket." An interesting moment came before the jury entered on Wednesday, when Ellis pushed back against prosecutors' use of the word "oligarch" when describing the rich, powerful Ukrainian businessmen who paid for much of Manafort's consulting work. Ellis said the term could be perceived as negative and could potentially bias jurors against Manafort. "We're not going to have the case tried where [Manafort] is associated with despicable people so he is despicable," Ellis said. "That's not the American way." Washington Post reporter Rachel Weiner said on Twitter that she once had a phone conversation with the judge that lasted a couple sentences before he said he wouldn't talk to her about cases. "Congratulations," Ellis added, "this is the longest conversation I've ever had with a reporter." Still, Ellis has shown a soft side over the past week. He granted a request by the jury to bring birthday cake last Friday, presumably to celebrate the birthday of one of the jurors. As mentioned, prosecutors say they hope to rest their case this week. That fits within the three-week timetable Ellis said he was hoping for before the trial began. The trial resumes Monday afternoon with the cross-examination of Laporta. She testified Friday about how she seemed to suspect Manafort and Gates were falsifying documents to inflate Manafort's worth, so he could qualify for loans. She is the first witness in the trial to testify under immunity from the government. After Laporta, the remainder of the prosecution's witness list is unclear. And it remains murky exactly when Gates is expected to testify.